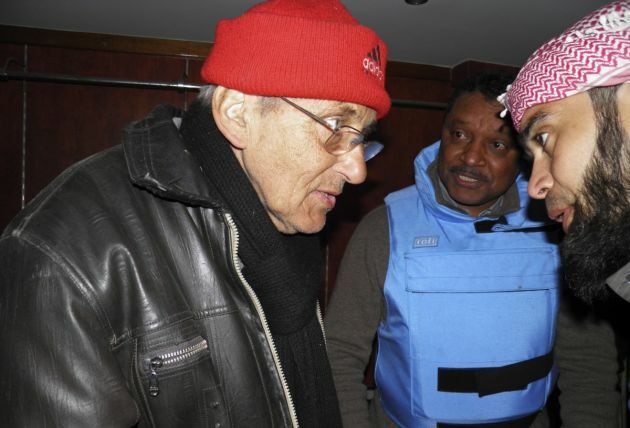 (Photo: REUTERS / Thaer Al Khalidiya)United Nations members meet with Dutch Jesuit Father Frans van der Lugt (L) and Sheikh Abu Harith al-Khalidi (R), who was in charge of negotiations for civilians inside the besieged area of Homs, in the besieged neighborhoods of Homs to supply humanitarian aid February 8, 2014. Van der Lugt was abducted and shot dead in April. The al-Qaeda-affiliated al-Nusra Front has abducted a Franciscan parish priest and about 20 parishioners in northern Syria. Father Hanna Jallouf was taken from the convent in the village of Qunyeh in the Orontes valley, a historical Christian center in north Syria on Sunday, Vatican Insider reported. A number of Franciscan nuns in the convent were forced to take refuge in nearby houses. Qunyeh is a village of several hundred people, some eight kilometres (five miles) from the border with Turkey. The 62-year-old Father Hanna is Syrian and has worked in the convent for 12 years. A source linked to the Franciscan Order in Aleppo said that the rebels forced their way to the convent and "looted everything." He said the rebels were "angry with Father Hanna because he refused to give them some of the olives harvested from trees on the convent's land." Fides News Agency said that a member of the Order of the Friars Minor confirmed the abduction. But The Custody of the Holy Land that heads all Franciscans in the Holy Land, admitted it has no news about the priest. "We are not able to say where father Hanna and his parishioners are now and, at this time, we have no possibility of contact with him or his captors," a statement issued by the Custody of the Holy Land reads. Senior Franciscan official Father Pierbattista Pizzaballa, Custos of the Holy Land, told the AFP news agency that Hanna and the other Christians had been accused of being "collaborators" with the regime of Syrian President Bashar al-Assad. "We don't know what to do. We don't know with whom to talk, we're totally unable to get in touch with anyone," added Pizzaballa. Meanwhile, a local Syrian activist revealed that Al-Nusra had been trying to claim part of the Franciscan property in Qunyeh, forcing Hanna to complain to a religious court late last week. In recent weeks, al-Nusra leaders expressed their desire to join the Islamic State in an effort to "overcome the competition" between the two Islamist entities.